"Millions of spiritual creatures walk the earth unseen, both when we sleep and when we awake." There are many different types of angels according to the Holy Bible. These beings are identified well over three hundred different times in the Bible as beings that are quite real and personally created by God. It is believed that angels were created within the first two days of the creation of the world. It has been established by theologians that angels may be purely spiritual or they may evil. Throughout the Bible, the angels of God held many responsibilities. They were identified as being messengers and as entities that worked to protect people. In addition to this, they were identified as spirits that assist with God’s own judgments. There are many strange mysteries that surround these beings. One of the most intriguing is the classification system associated with angels. Here, you will learn about the types of angels that are included in this organizational system. According to the scripture and studies performed by theologians, the highest class when it comes to types of angels are those that are identified as cherubim. These angels are said to engage in aspects of God – such as his pure glory and his extreme level of holiness. 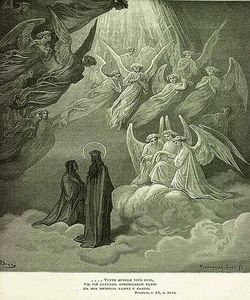 These angels are depicted in the Holy Bible as spiritual beings that are directly involved in the glorious worship and the respectful praise of God himself. You will first learn of these types of angels in the Book of Genesis. It occurs in the 24th verse of the 3rd chapter of this book. The purpose of the first cherubim mentioned in the Bible was to protect the path that led to the tree of the life in the garden Adam and Eve resided at. These angels were issued swords with flames that they moved from one side to another. The angel types that are referred to as seraphim are also referred to as the “burning ones”. These celestial beings are also considered to rank high when it comes to the basic classification of angels. The world was introduced to these beings in the Old Testament that is included in the Hebrew based Bible, which is also known among many as the “Tanakh”. These angels are described as being similar to humans in their natural form. The Jewish scripture really did not place a high emphasis on these celestial creatures. However, when the information was passed on to those that were Christian, the beings were exalted in the hierarchy of celestial spirits. The Christians upheld these beings because of the fact that they believed that they actually were the caretakers of the throne of God. When it comes to the strange mysteries of the types of angels, it is important to mention the ophanim. The world was introduced to these celestial beings in the Book of Enoch in the Bible. It is believed that these angels are directly responsible for watching over the throne of God for eternity. The physical appearances of these beings are quite different than other types of angels. They are said to resemble a wheel with many eyes over them. It has also been expressed that they possess a light that is quite bright within themselves. Many refer to this light as “Heavenly Light” or an “Eternal Flame”. The nephilim are introduced in the Book of Genesis of the Holy Bible in chapter 6. You may also read other types of scripture and even texts from the Jewish that mention this angel type. These celestial beings are believed to be oversized children of those that are considered to be the sons of God. They are said to be half human. Many believe that these creatures are half angel. It is believed that the fallen angels interacted with humans and married those humans. Once married, they had a child that was both an angel and a human. These beings are said to possess all of the qualities of mankind – including the evil that many humans possess. As you can see from the information contained within this guide on the strange mysteries of the classification of angels, there are many. These beings were often described throughout the Holy Bible. There are many different classifications of angels. However, the one that you have just been introduced to is considered to be one of the most commonly agreed on hierarchy. Topics pertaining to angels and their purpose in our world and the spiritual world are considered to be strange mysteries as there is still no concrete validation that these beings exist. If you enjoy researching strange mysteries, learning the types of angels will prove to be quite exciting for you.